Due to a wet growing season the tomato crop, especially in high tunnels, has been infected by leaf mold. Some growers experienced difficulties associated with leaf mold in June while others are getting their crop infected now. Tomato leaf mold is caused by Fulvia fulva (also known as Cladosporium fulvum). This fungus attacks during cloudy, humid weather and can be particularly severe in plastic greenhouses. We certainly have had weather that would favour this pathogen. Tomato leaf mold can spread very quickly under humid conditions such as we have been experiencing lately. It is key (even more important than fungicides) to increase air flow through the crop and to lower the humidity. It is advisable to crack the vents at dusk and increase night-time temperatures so that they are above outdoor temperatures to prevent high humidity in the greenhouse. Heat during rainy days might also be required. Pruning off the lower leaves will help to get air flow through the crop and reduce infection. Air movement with fans is also a good idea. If the infection is serious and the crop is nearing the end of production, it might be best to harvest what you can without investing more money/effort in control. There are not many fungicide choices. Fontelis and Pristine are registered for Cladosporium suppression on other crops, but both fungicides are also registered on tomato for Botrytis and Alternaria control. 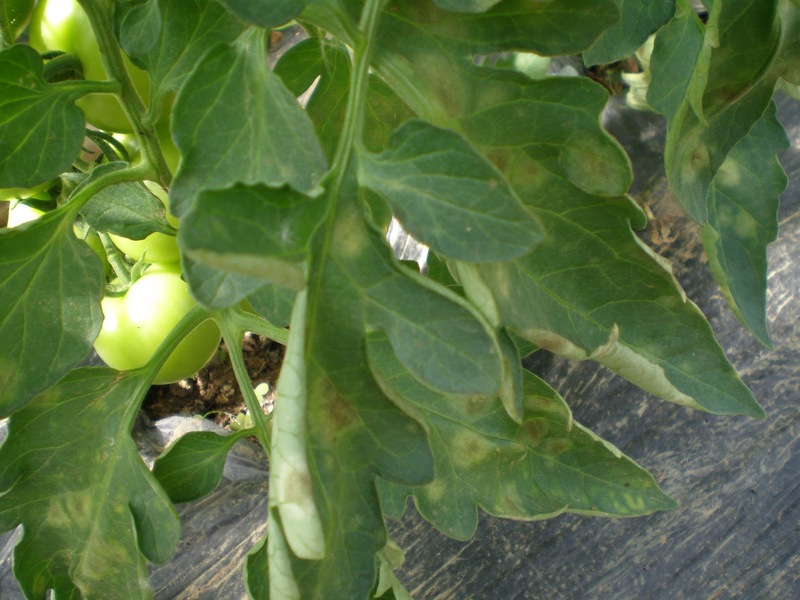 Early blight, botrytis and septoria have all been found in tomato crops. Given warm, humid weather it is likely that before too long we might see late blight on tomatoes. In addition to proper canopy management, pruning out the diseased foliage and proper ventilation, it may be necessary to keep ahead of diseases by providing periodic fungicide applications. For more information please see the Tomato Management Schedule - a guide to weed, insect and disease management in tomatoes.